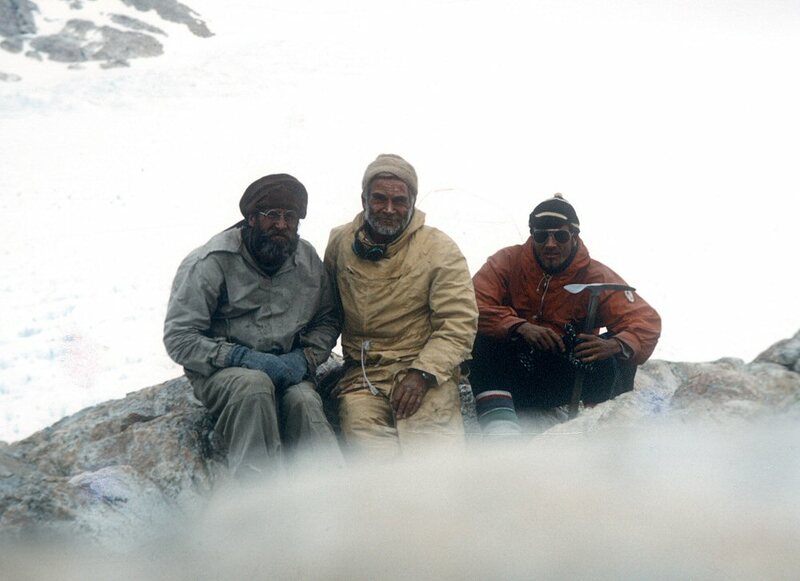 The book begins with his development of the theme of ‘sailing to climb’, an expedition form which in the 21st century is becoming increasingly popular but which, in no small part, owes its existence to the account written in this book. “Proverbially it is not easy to blow and swallow at the same time. So also it is not easy to combine mountaineering and sailing. There are, however, one or two places where such a thing can be done. In the Lofoten Islands a man can sail to the foot of his chosen rock face. On the southernmost coast of Chile, where the high Andes begin to dwindle, there are glaciers reaching down to the sea where a mountaineer can step from his boat and begin his climb at sea-level. A region such as this has an irresistible attraction for a mountaineer who, late in life, catches sea fever and aspires to making an ocean voyage in his own boat. These Chilean glaciers have their origin in the Patagonian ice-cap (Hielo Continental as it is known there). This covers some 400 or 500 miles between 44° and 51° S., and varies in width from 20 to 50 miles and in height from 6000 to 10,000 ft. I first heard of its attractions in 1945, just after the war, from a friend who had learnt of it while a prisoner in Germany. 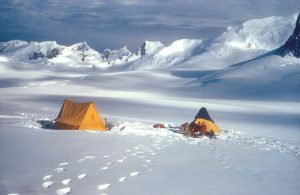 For the most part the ice-cap was unexplored. No one yet had crossed it, and its glaciers, besides coming so conveniently down to the sea, had other strangely attractive features. Trees grew upon them—one felt this must be an exaggeration. Humming birds and parrots nestled in their branches and penguins paced the ice beneath. On the Argentine side of the range—the accepted way of approach—there were great lakes and forests, and beyond those to the east there were the rolling pampas where millions of sheep roamed, attended by gaucho shepherds, wild characters who lived on meat and maté tea, and rode down ostriches with whirling bolas. Thus was born the germ of an idea. Not only did the maps of the day in the 1950s still show large, remote areas which remained unexplored and consequently un-mapped, but in the higher latitudes, these areas often gave access to unclimbed glaciers and peaks. In the case of the numerous islands of the Arctic and the Antarctic, these destinations could normally only be reached after long voyages, the most practical, cost effective mode of transport being a small, sturdily built, sailing ship. As Tilman develops his justification for this new form of expedition, sailing to climb, he draws parallels between climbers and sailors. The early part of the book covers his purchase of Mischief, the 1904 vintage former Bristol Pilot Cutter, and his early experience of the difficulties associated with finding the right crew. On at least one occasion this leads to his first experience of what he would come to term in later years a ‘polite mutiny’. 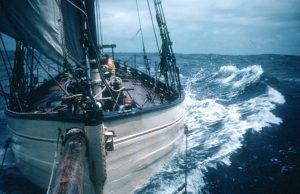 Once provisioned and with a full crew, Mischief set sail south to the Antarctic from Lymington in Hampshire, the Solent port which would become Tilman’s sailing base for the rest of his days. On arrival in Patagonia, the ship’s company was divided into two parts, the shore party leaving to make the crossing of the icecap while the remainder of the crew, shorthanded, took the boat back on a not uneventful trip through the hostile waters of the Strait of Magellan to pick up the climbing party on ‘the other side’. What sounds simple enough in that single sentence belies the complexity and danger associated with this undertaking. Charles Marriott, H.W. Tilman and Jorge Quinteros – the shore party on the crossing of the Patagonian icecap. 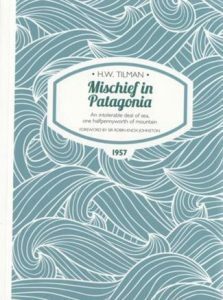 Extracts from ‘Mischief in Patagonia‘ by H.W. Tilman. First published by Cambridge University Press in 1957. Revised edition by Tilman Books, 2015. The full Collected Edition of Tilman’s books are available from Lodestar Books.